Built by John D. Howland circa 1856~1857. Later owned and occupied by John H. Farquhar, Merchant, Member of Congress; Aaron C. Miller, Merchant; John C. Hitt, Banker; Dr. John R. Goodwin, Banker, Civil War Surgeon, Paymaster in the Department of the Interior, Trustee of DePauw University; his son Charles F. Goodwin Banker and Trustee o DePauw University; and his grandson John P. Goodwin, banker and long~time member of the Indiana Library and historical Board. In possession of the Goodwin family 1872~1944. Erected 1965 by John P. Goodwin. Location. 39° 25.408′ N, 85° 0.747′ W. Marker is in Brookville, Indiana, in Franklin County. Marker is on Main Street (State Road 52), on the right when traveling north. Touch for map. 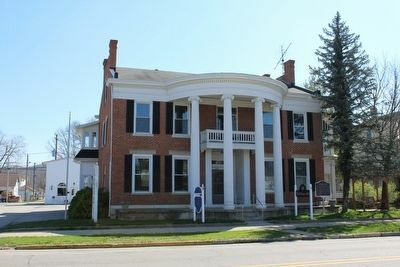 Marker is at or near this postal address: 813 Main Street, Brookville IN 47012, United States of America. Touch for directions. The Purple Heart (approx. 0.2 miles away); Old Brookville Church and Cemetery (approx. 0.2 miles away); Brookville's Grandstand (approx. ¼ mile away); Brookville Historic District (approx. 0.3 miles away); The Courthouse Square (approx. 0.3 miles away). Touch for a list and map of all markers in Brookville. More. 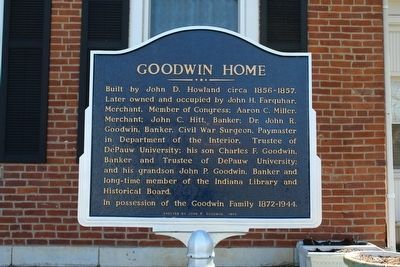 Search the internet for Goodwin Home. Credits. This page was last revised on June 16, 2016. This page originally submitted on April 24, 2016, by Tom Bosse of Jefferson City, Tennessee. This page has been viewed 138 times since then and 7 times this year. Photos: 1, 2. submitted on April 24, 2016, by Tom Bosse of Jefferson City, Tennessee. • Bill Pfingsten was the editor who published this page.